Visit our new Ice Cream Parlour and enjoy a tasty treat! 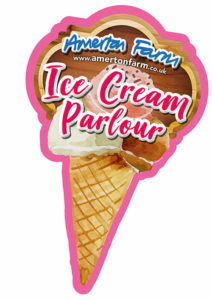 Amerton Ice Cream was one of the first items to be produced on the farm when it opened to the general public in 1984. Made with Jersey cream, it is still produced today using the original recipes by a local Staffordshire ice-cream parlour. Flavours include; Vanilla, Strawberry, Chocolate, Mint Choc Chip, Banana & Toffee, Cherry, Rum & Raisin, Raspberry Pavlova, unicorn and an exclusive Squashed Frog flavour only found at Amerton Farm. Our ice cream has to be tasted to be believed!